When: Tuesday, February 10, 2015 6:30 p.m. 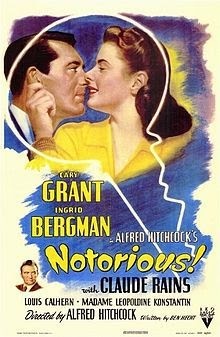 Notorious is the most complex and perhaps the best of Alfred Hitchcock’s films produced during his first decade in America. 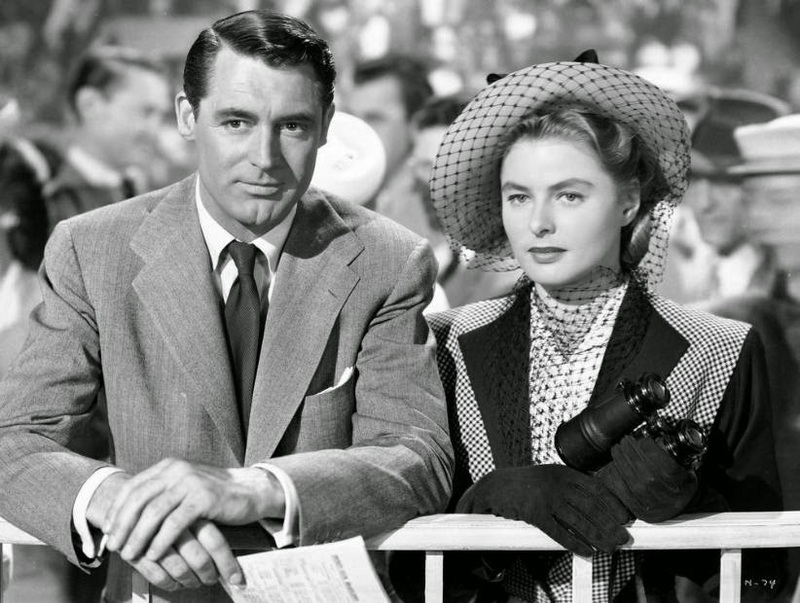 The film features the star power of Cary Grant and Ingrid Bergman, two of the director’s favorite performers. It also showcases the director’s technical storytelling skills, skills that he honed during his tenure in Hollywood. Grant and Bergman were two of the most glamorous movies stars of the day and they are photographed exquisitely by famed cinematographer Ted Tetzlaff. The close-ups of the two stars are beautifully lit and staged. Many of the shots are framed so well that they stand on their own as works of art. The plot revolves around Alicia Huberman (Bergman), the American daughter of a convicted Nazi spy. Intelligence agent T. R. Devlin (Grant) recruits her to infiltrate a group of Nazis hiding out in Brazil after World War II. Devlin arranges things so that Alicia reacquaints herself, with Alexander Sebastian (Claude Rains), the leader of the Nazis in Rio de Janeiro. Sebastian was smitten with Alicia several years earlier and is eager to try and woo her once again. Things get complicated when Sebastian proposes marriage to Alicia. Devlin who has feelings for her reacts badly to this development and withdraws emotionally. Alicia marries Sebastian and continues her work as an agent of the United States government. After a party at their home, Sebastian discovers that his wife is a double agent and has been spying on him. With the help of his mother (Leopoldine Konstantin), Sebastian sets about to slowly poison Alicia in an attempt to hide her true identity from his fellow Nazi conspirators. Will his plan be successful? Before the movie, grab a cup of coffee from Overflow Coffee Bar, located within the Daystar Center. You can bring food and beverages into the auditorium; we even have small tables set up next to some of the seats. General Admission: $5 Students and Senior Citizens: $3. Once a month we screen a classic film and have a brief discussion afterward. For more information, including how to join (it’s free), click here. To purchase your ticket in advance, click here. The Venue 1550 is easily accessible by the CTA. Please visit Transit Chicago for more information on transportation options. Backstory: David O. Selznik had originally planned to produce Notorious himself, but sold the property to RKO. Selznik lobbied for Joseph Cotton, who was under contract to the producer, to play Devlin. Hitchcock wanted Cary Grant. Hitchcock obviously won that fight. Clifton Webb and George Saunders were considered for the role of Sebastian. Selznik recommended Claude Rains for the role, which Hichcock agreed with. Notorious premiered at Radio City Music Hall in New York City on August 15, 1946 with Hitchcock, Bergman and Grant in attendance.